Vintage sequin top; Plaid pants by DKNY; Fringe boots by Forever 21; Purse by Style & Co. I love how you paired those hot plaid pants with that vintage sequin top. You look great! Love this top!! 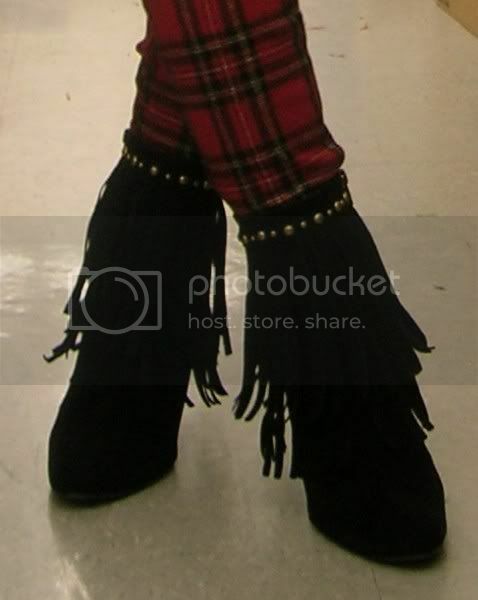 It looks great paired with your plaid pants (I would have never thought of putting sequins with plaid, but I love it)!! Love the mix btw the gorgeous sequins top and the plaid pants! I love the sequin shirt ! I adore your top and boots, very glam. I didn't expect that you can wear sequin top with that pants, I like it!! this blog is so bad. your outfits are embarrassingly ugly. and you desperatly need to cut your hair. your photographer does horrible work as well. Love the boots and the shirt! Aww, little "oprag".. I see you're too embarrassed by your comment to put your actual name and website. oooooooooooooooOOh la la la. You are stunning, and your hair, and style, is so beautiful. I am inspired. How stunning is that top!!! Great ankle boots too! I connected through another blog.. you have a unique way of putting clothes together. wow!! you're beautiful and look sooooooooooooo cute..
thanks for stopping by dear.. appreciate that!! hope we can make it long together..
Just found your blog, and I have to say it's amazing! :) Love the outfit! you remind me of ruth lorenzo from last year's x factor! I totally love that you straight up took pics in a store! That top is phenomenal! The duo of plaid and sequins is interesting...it's like if Hollywood and Seattle had a baby, that's what it would be wearing. i love this whole look!! !